Regular expressions (regex or regexp) provide a concise and flexible means for matching strings of text, for instance particular characters, words, or patterns of characters. A regular expression is written in a formal language that can be interpreted by a normal expression processor, a program that either serves as a parser generator or examines text and identifies parts that match the provided specification. Learning regex or regular expressions is a little bit challenging, you need to try and errors many times before you got a regular expressions you want (note: for a complex regex). 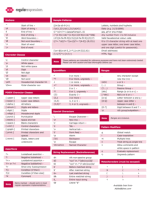 So to learn regex or regular expressions you can download this cheat sheet to help you.